Make sure to place two AAA batteries in WalkWise before you install it. Using a phillips-head screw driver, unscrew the battery covers on the front of your WalkWise device. Insert the AAA batteries as shown, with the positive battery terminals touching the flat battery contact in each compartment. Replace the battery covers and screws. Test that WalkWise is functioning properly by watching for the Node to blink after a walking event (as described below). Insert the zip-ties through the holes around WalkWise, aligning them with the location of the spokes on the walker wheel. Place WalkWise on the surface of the wheel and insert each zip-tie end into its own receptacle, making sure that the zip ties is wrapped around a wheel spoke. Complete these steps again so there are 2-3 zip-ties around wheel spokes. Once all are in place, tighten each of the zip-ties to secure. Cut off excess material with scissors or wire cutters and ensure that wheel rotation is not affected by the zip-tie placement. If it is, you may need to use the wire attachment method. Place three wires at various locations through the holes on your WalkWise device so that both ends extend out the back. Do your best to align the wires with the location of spokes on your wheel. Place WalkWise on the walker wheel and turn your attention to the back of the wheel. If necessary, pull the wires ends around to the back, and make sure each wire wraps around a wheel spoke. You may need to adjust the wire location at this point. Twist each wire together with itself around the spoke, like using a twist-tie on a bag of bread. Pull the wires tightly while twisting. Fold the remaining wire into the wheel to ensure free rotation. If you are attaching WalkWise to a solid wheel, use the supplied Dual-Lock strips. First, remove the film covering the adhesive on three strips, and adhere them to the back of the device, as shown below. Then, press the remaining three strips into the strips you just placed. Remove the film on each, and place on the wheel, pressing firmly to adhere. The device is now firmly in place, but can be removed with sufficient force to un-snap the dual-lock material. If you want to receive alerts and view fitness data, you will need to visit walkwiseapp.com OR download the app on a phone or tablet. Go to the Apple App Store or the Google Play Store to download the WalkWise App. Each individual should have their own account. Multiple accounts can have access to the same WalkWise device, so you should use your own email and a unique password to register. For example, four separate accounts should be set up for the walker user, a child, a caregiver, and a physical therapist. This way, the child can set up safety and health alerts that would NOT be received by a therapist. The Device ID is located on the WalkWise walker attachment, and the password is located on the instruction sheet included in the box. When you successfully add the device, the app will take you through the setup instructions. If you are setting up the device for the first time, you will need to change the Username (the person using the walker), the Wheel Diameter (the size of the walker wheel, in millimeters), and the Time Zone (where the walker user is located). You can also set up a daily walking goal. 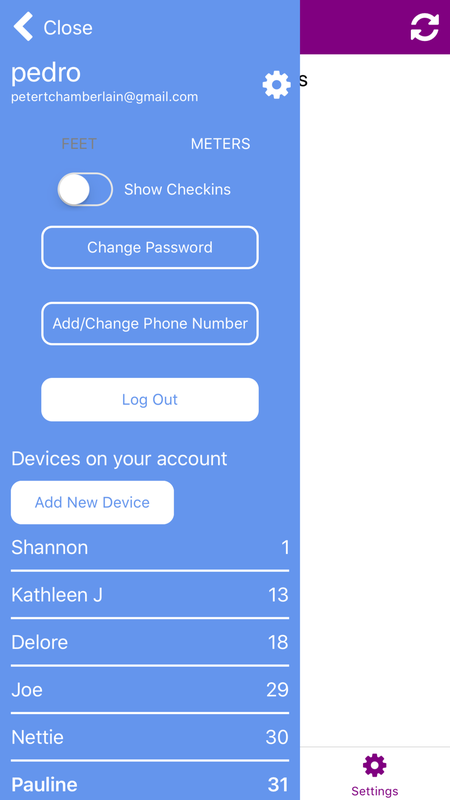 This workflow will only need to be done by one account, as the information about this WalkWise device will be shared with others who have access to it. This walker wheel is about 125 millimeters in diameter (12.5 cm). When you have finished setting up the device, you have the option to set up customized alerts to be sent to your devices and email account. You can edit these later on the “Settings” page. If you want to receive phone call or text message alerts, make sure to go to the Account Settings and add your phone number. If you would like to add a land-line phone, please contact us and we can add it to your account. Connect the Node to a WiFi network in order to receive data from the WalkWise device. Plug in the power cable to the Node. Plug in the Node to a surge-protected power strip. The yellow light on the bottom of the Node should illuminate for a short period just after plugging it in. The Node takes between 30 and 60 seconds to initialize. After initializing, the yellow light will blink quickly as it attempts to connect to a known WiFi network. 6. During setup, the connection with fail and the light will become solid yellow. 7. Make sure bluetooth is enabled on your phone or tablet. 9. Follow the instructions on the app to input your network name and network password. This is the password you would use if you were connecting a new computer to your internet. If you are typing in the network name, make sure it is typed exactly, such as with spaces and dashes included. 10. If you see the “Success” message, you are done! Move the walker a bit, stop walking, and then make sure the Node blinks yellow after about 10 seconds. 11. If you see the “Failed” message, try again. Sometimes the Node or wireless network encounters an error and the password needs to be sent again.